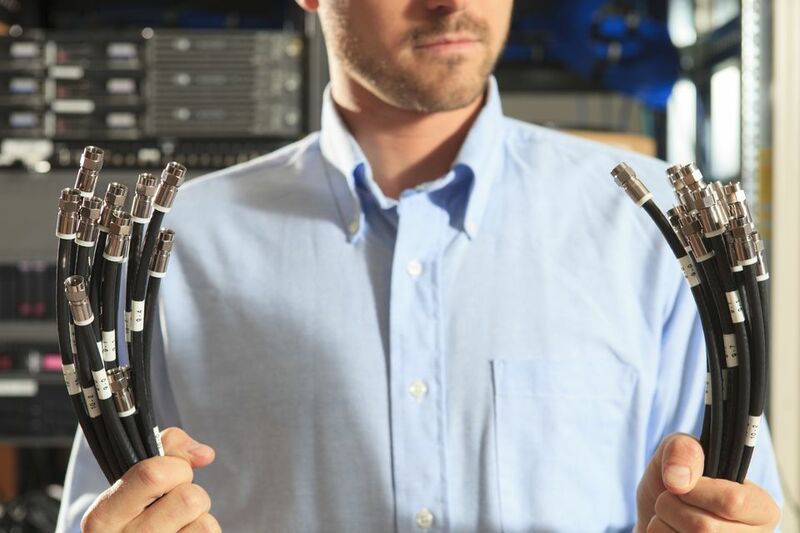 Traditional coaxial cables were once the standard means of connecting a television to an antenna or cable TV access point, but they are less common now that high-definition and ultra-high-definition televisions make prevalent use of HDMI, fiber optical, and ethernet cables for many of their connections. Still, coaxial cables have their purposes, and your video system may still use them. A coaxial cable used to bring electronic signals to a television or other electronic device terminates in a fitting called an F-connector, which is the fitting that actually connects to the television or wall jack. There are several ways these F-connectors can be attached to coaxial cable. Professional installers use a coaxial cable stripper, which strips all three layers of the cable at once. Then, they slip on the F-connector and secure it with a coaxial cable tool, which presses the connector onto the cable and crimps it at the same time. But if you're not a pro, you probably don't have these special tools—but you may own (or can borrow) a basic cable crimper that will allow you to install a crimp-type F-connector. Don't have a crimper? No problem—simply buy a twist-on F-connector, which you can install by hand. As for stripping the cable before adding the connector, an ordinary utility knife will do the trick. It helps to have standard electrical wire strippers for one of the steps, but you can also do this with the utility knife. First, you'll strip 3/4 inch of the black outer jacket from the end of the coaxial cable, using a utility knife. Carefully make a shallow cut all the way around the cable, cutting through the outer jacket only. Use your fingernails to peel away the jacket from the cable. This exposes the layer of fine metal shielding wires and foil just inside the jacket. Fold back the shielding wires onto the cable jacket, and trim them with wire strippers or scissors so they are about 1/8 inch long. Now, use the utility knife to cut through the metal shielding foil so it extends only about 1/4 inch from the cut in the cable jacket. Again, the wires are folded back onto the jacket, while the foil extends 1/4 inch toward the end of the cable. Strip 1/4 inch of the white plastic insulating layer from around the copper wire core of the cable, using wire strippers or a utility knife. Be very careful not to cut or nick the copper wire itself, as this can affect the cable's performance. There should now be 1/4 inch of the bare copper wire extending from the end of the white plastic layer. On a crimp-type F-connector, place the crimping tool jaws over the crimp ring of the F-connector, and squeeze the tool handles to secure the connector to the cable. You are now finished.